Subscribe to DTM Newsletter and Receive a Free Ebook! 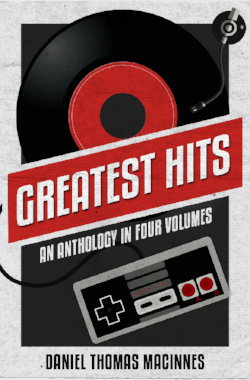 Greatest Hits: An Anthology in Four Volumes is a compilation book of essays, reviews and memoirs from two current books (Zen Arcade, Pop Life) and two upcoming books (Video Game Classics, Conversations on Ghibli). Author Daniel Thomas MacInnes examines and dissects the pop culture universe -- film and television, animation and live-action, music and audio, video and computer games, politics and daily life -- with sharp wit, humor and insight. Greatest Hits essays include: ActRaiser, Anne of Green Gables, California Games, Donkey Kong Country, Herzog Zwei, My Neighbor Totoro, Napoleon Dynamite, Ratatouille, Sonic CD, Spirited Away, The Thriller Zombies Come to Chew on the Corpse, Truth is the First Casualty of War, and 80 more. This book was released in ebook and paperbook on November 21, 2017. We are now sharing the digital version with you as our personal thanks for subscribing to the DTM Newsletter. To receive your free ebook, simply enter your name and email address below, and a download link will be sent directly to your inbox.